WASHINGTON (Army News Service, March 8, 2013) — A report released Friday by the Army’s surgeon general found a high degree of validity in the service’s diagnoses and treatment of post-traumatic stress disorder. Lt. Gen. Patricia D. Horoho discussed findings of the Army Task Force on Behavioral Health during a media roundtable Friday at the Pentagon. She said their report found “no systemic issues of Soldiers being disadvantaged in the disability process” regarding the diagnoses of post-traumatic stress disorder, which is known as PTSD. That re-validation percentage means that reviewers agreed with 88 percent of the PTSD diagnoses Soldiers were given. She said in the remaining 12 percent, the reviewers disagreed with the physicians’ diagnoses — meaning roughly six percent who were diagnosed with PTSD should not have been and about another six percent should have received a PTSD diagnoses, but did not. “This re-validation rate is extraordinary when compared to diagnostics re-validation rates in the civilian sector,” the Army surgeon general said, explaining that according to medical literature, the re-validation rates for PTSD range from 49 to 89 percent, depending on the diagnoses standards used by physicians. Horoho said the other good news is that about 80 percent of Soldiers diagnosed with PTSD remain on active duty and just 20 percent go through the Integrated Disability Evaluation System, or IDES process of transitioning to civilian life and care within the Department of Veterans Affairs. The 80 percent retention rate “says PTSD is a diagnosis that can be treatable” and allow Soldiers to remain in the Army, Horoho said. The diagnostic re-validation report was part of a larger effort of the Army Task Force on Behavioral Health, directed by Secretary of the Army John McHugh. The task force looked into all facets of behavioral health care identification, treatment and delivery Army-wide. The task force worked closely with the Army Audit Agency, Army Research Institute, Office of the Inspector General, Army surgeon general, VA and Centers of Excellence for Psychological Health and Traumatic Brain Injury, said Samuel B. Retherford, deputy assistant secretary of the Army for Military Personnel Policy during the media roundtable. Additionally, the task force interviewed and surveyed behavioral health care practitioners and Soldiers receiving treatment. The task force also conducted extensive literature reviews regarding behavioral health care, he said, looking at outcome-based care, which the Army is moving toward. The task force corrective action plan calls for the Army to continue to better collaborate with the VA to improve delivery of IDES; ensure adequate oversight and controls on standardization of diagnosis, training and treatment of PTSD; make it easier for Soldiers and providers to track progress through the IDES system; and better locate providers to places where Soldiers are stationed or deployed, Retherford said. Additionally, the task force called on diagnostic re-validation studies of behavioral health issues other than PTSD. 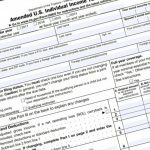 On March 5, the secretary signed implementation guidance for the corrective action plan, which contains the task force’s recommendations. Quarterly progress reports on the plan will be delivered to the secretary and most recommendations are expected to be implemented within a year, he said. Over the last few years, the Army has about doubled the number of its behavioral health care providers, Horoho said. Health care providers include civilian and military social workers, behavioral health technicians, physical therapists, psychologists and psychiatrists. 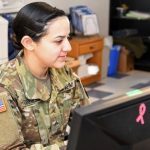 Not only has there been an increase in providers, those providers have been placed where they are needed most, she said, citing examples of embedded health care teams in Afghanistan and within brigade combat teams. 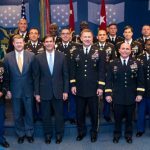 The Army plans to continue with the expansion, she said, with the goal of embedding the teams within other units that are not brigade combat teams, or BCTs. Lt. Gen. Howard B. Bromberg, deputy chief of staff, G-1, echoed Horoho’s enthusiasm for the embeds, adding that the value of health care embeds is not just in relationship building with Soldiers, but also in building close relationships with commanders. He said the health care providers can advise the commanders and help bring about cultural change associated with the stigma of seeking help for behavioral conditions. Commanders are looking at behavior health in a new light, said Bromberg, who has overall responsibility for Soldier personnel readiness and management and is the lead for IDES. They are including behavioral health plans on their priority checklist right alongside ammunition, training and other requirements, he said. 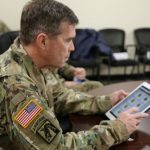 Bromberg acknowledged that the “system is complicated and can be frustrating at times for Soldiers and their families who are going through the disability system.” However, he said the process has improved since the IDES system was instituted Army-wide in 2010. As recently as 18 months ago, the administration of behavioral health was largely done with paperwork, he said. Now, electronic systems are used. Collaboration with the VA has also improved and Army services are now often collocated with those of the VA.
Just a few years ago, Soldiers would sometimes have to wait 12 to 18 months for disability payments. Now, their first checks often arrive within 30 days, he said. Soldiers can also be their own advocates, he added. Throughout the IDES process, they have the right to rebut findings and seek second opinions if they disagree with particular diagnoses, he said. (For more ARNEWS stories, visit www.army.mil/ARNews, or Facebook at www.facebook.com/ArmyNewsService.